This leaflet is for J McCall and Co, jam manufactures. Jam was introduced to the British diet in the 1880s. Factory produced jams were not especially nutritious but they were vividly coloured contained lots of sugar and were very cheap and they provided a welcome addition to the diet of the very poor. 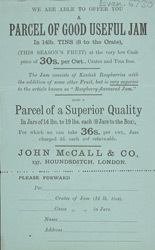 Jams sold for about 6 pence per pound and there were many different flavours available, although it is raspberry jam that featured on this leaflet.